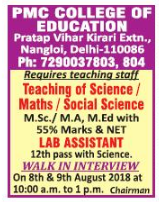 Faculty ON Jobs: PMC College of Education, New Delhi has advertised in THE HINDUSTAN TIMES newspaper for the recruitment of Teaching Faculty- Assistant Professor / Lab Assistant jobs vacancies. Interested and eligible job aspirants are requested to walk-in on 08th and 09th August 2018. Check out further more details below. About College: The PMC College of Education established in the year of 2000 in Pratap Vihar, Kirari Extn., Nangloi, Delhi - 110086 by the PSM Public School Educational society (Regd) which is non-profiting , non-proprietary body and which is already running the PSM Public Sr. Sec. School , affiliated to CBSE.The PMC College of Education takes pride in having the services of highly qualified and competent teaching faculty and an Advisory Board of eminent scholars and teacher educators. How to Apply: Interested and eligible candidates are requested to bring resume with passport size photograph and original certificates to following address on 08th and 09th August at 10:00 am to 01:00 pm for an interview. Nangloi, New Delhi - 110086, India.